This is a Japanese Recipe. In Japanese , Su means Vinegar and Shi if from meshi ,Japanese word for rice, so the word formed as sushi. Normally people think that sushi means made out of Raw fish. But this isn’t true. The fish looks raw but it goes under many processings. Some sushi’s are rolled inside out and some from outside to inside. Recipe for sushi remains mostly the same for most of the time. It depends on what stuffing you use to roll. Mostly Crab meat is used in sushi. 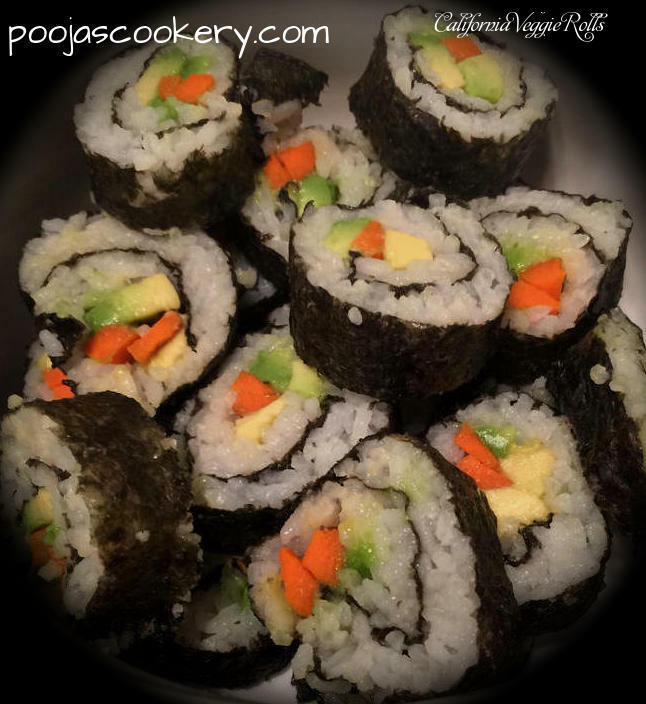 But if you use plain veggies inside, it becomes vegetarian sushi or california Veggie roll. 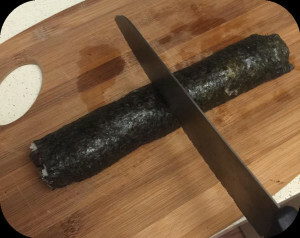 I was bit skeptical about how to make sushi at home earlier when my son taught me how to do. He told me that in his school they taught them sushi roll recipe. In this recipe I used Vegetables , so it is completely vegetarian sushi. 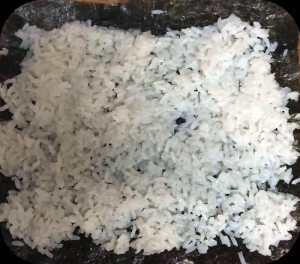 Add salt and mix thoroughly.Cook 1 cup rice with 1 and 1/2 cup water . Make the rice soft. In a bowl take rice vinegar , sugar and Add rice to it and mix. Take one seaweed and spread rice mixture over it in a thin layer. 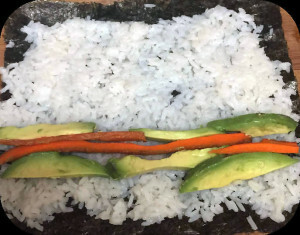 Now how to make sushi rolls? Arrange the vegetables as shown. Press it so that the roll gets tightened. Cut the roll into half first with sharp knife. Don’t put pressure on knife while cutting. Just make back and forth motion. Cut them into 1/2 inch thick pieces. One seaweed can make around 8-9 pieces. Don’t warm them before eating. Just eat at they are along with seaweed. 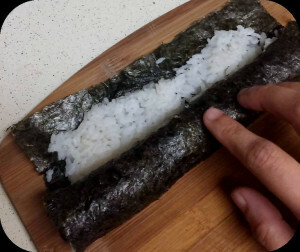 Now how to make sushi rolls? Arrange the vegetables. Cut the roll into half first with sharp knife. Don't put pressure on knife while cutting. Just make back and forth motion. Cut them into 1/2 inch thick pieces. One seaweed can make around 8-9 pieces. Don't warm them before eating. Just eat at they are along with seaweed.